• 2,604 sq. ft., 3 bath, 3 bdrm single story – $550,000 USD. Amapas, Puerto Vallarta – Live the good life in this beautiful turn-key property with ocean, town and mountain views Condominium located in Amapas, one of Puerto Vallarta’s most prestigious neighborhood, this beautiful condo has 3 bedrooms PLUS den with a wrap-around terrace that offers stunning ocean and town views!. It´s proximity to the romantic zone offers an easy walk to the beach, restaurants, shopping, events, market and all the ammenities that Puerto Vallarta downtown offers. 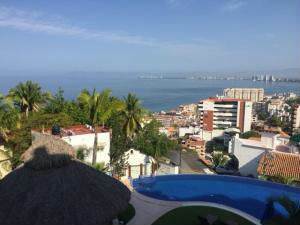 It has as spacious Bar, deck terrace, totally equipped it´s marble floors and high-end finishings give this condo the feeling of a home, It has private laundry room, pus view of mountains and a town full of lights as the sun sets. Covered parking is included as well as a very nice sparkling community swimming pool with palapa and bar.